NPR’s Robert Krulwich recently shared on his blog a fantastic stitching together of processes that operate on vastly different time scales: geology, economics and politics. 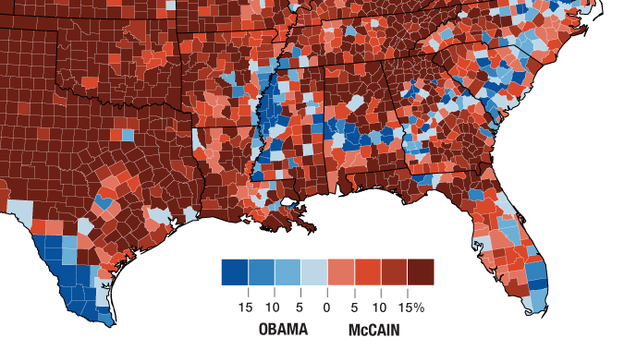 It took the eye of a geologist – Steven Dutch – to recognize the deep-time significance of a narrow corridor of counties running through Mississippi, Alabama, Georgia and into the Carolinas that voted majority Democratic in the 02008 U.S. presidential election. That swath of land is largely populated by African Americans, which is the most immediate part of the answer, but the story begins about 100 million years ago during the Cretaceous Period. The Deep South had a shoreline that curled through the Carolinas, Georgia, Alabama and Mississippi, and there, in the shallow waters just offshore, were immense populations of floating, single-celled creatures who drifted about, trapped sunshine, captured carbon, then died and sank to the sea bottom. Those creatures became long stretches of nutritious chalk. When sea levels dropped and North America took on its modern shape, those ancient beaches — so alkaline, porous and rich with organic material — became a “black belt” of rich soil, running right through the South. That’s the geology part of the equation. Then comes the economics – when Europeans began farming crops like cotton in the South, they were using slaves. The most fertile areas were where slavery was most profitable, so the percentage of the population that was black became the highest in the region. That demography – or, at least, very significant traces of it – remains today, and is responsible for the political part of the story. This, says marine biologist McClain, explains that odd stretch of Obama blue; it’s African-Americans sitting on old soil from ancient organisms that turned sunshine into fertilizer. Stewart Brand, co-founder of The Long Now Foundation, has described what he calls ‘layers of time,’ (described on our website). Different sorts of processes operate on different time scales, and those processes are layered one on top of the other – there is a sort of foundational order to them. Nature operates slowly. Culture operates more quickly, and is based on nature. The political landscape is many layers above the geological landscape. This story illustrates brilliantly one of the ways in which geology shines through the millennia to shape the quicker, more malleable processes of our human activities.